Hi, we're Gradual Games. We make games for the NES and PICO-8. config.txt: fullscreen_method 2 works better on some machines. I started tinkering with an _update60 cart the other day and I was getting stuttery behavior. Dug deep into possible performance bugs in my game. Then realized I had stuttery graphics (< 60 fps) in simpler cartridges. Dug deep into updating drivers and BIOS on my Dell laptop. Still nothing. This laptop is from 2012, but is more powerful than my rpi3 which has no problem with _update60. Then, I took a look at PICO-8's own config.txt file and found fullscreen_method. Tried method 2, which is actual fullscreen rather than stretching a window. How come 2 is not the default? Or maybe it is in fact the default and I'm forgetting having toyed with this months ago. Hobobot is about a robot that was destroyed and junked. But, his parts still work, and he wants to be whole again! Control each of Hobobot's two legs and two hands, and kick his head and get them all back to the torso! z - Switch hobobot piece under control. x - Perform action related to the current piece. Legs can kick, hands can grab. arrow keys/dpad - Move current hobobot piece left or right. Or, perform left/right action. enter - Bring up in-game menu. You must use this to restart the current level if you get stuck. The head cannot be controlled, you must kick it with one of the legs. There are 16 levels in total, which progress from fairly obvious mechanic-practice levels to mind-bending puzzles. I struggled with wanting to just keep working on this forever, but I'd rather release this and move on. Maybe I can make a sequel sometime, as it seems to be fertile ground for interesting puzzles. I love the new code display on the web player. I noticed one graphical artifact, which does not get in the way of reading the code but is nonetheless somewhat unpleasant. It appears like a second scrollbar, but is non-functional. See attached photo. "Invalid cart format" after web player boots. Sometimes when I play a cartridge from the web player from my phone, PICO-8 will show the splash screen and boot text, and then it will stop before playing the cart, printing the message: "invalid cart[ridge?] format." The issue can be worked around by refreshing, but whether it will then successfully boot appears to be intermittent and may require several refreshes. I have not seen the issue for a couple of days; but I realized I had not reported this nor had I seen it reported, so I thought it would be good to make a thread about it. Navigating away from a tab = no gfx update, but sound continues. Sorry if this is a duplicate, but I could not find my precise issue in the bugs discussion. in Chrome on Windows 7, I notice that if I navigate away from the tab and then back, that while I was not viewing the tab, graphics updates do not proceed. However, music continues. This breaks carts which rely on stat(20), stat(24), stat(26) etc. It is not a problem for me because I prefer to remain engaged with a cart as long as I am playing it anyway, but I am not certain if this issue was present prior to the recent updates or not. "COULD NOT CONNECT TO BBS" when searching in Splore for "short text"
I am unable to view the code from the bbs as previously. Also, searching for "small text" from within splore results in "COULD NOT CONNECT TO BBS" even though I'm able to refresh other parts of splore such as featured, new, etc. Separate metadata matrix (collision, other properties) from built-in map? In the game I'm building, I often have a need for an entity to basically make the map solid and impassable at a given location, but in the actual map editor these spaces would all be empty. Since the "flags" all reside in sprites, it seems the only way I could have dynamic collision flags or other metadata would be to use my own collision map. It would first be built from the map itself, then used dynamically thereafter by entities that need it. It seems like a sensible thing to do and I am curious if anyone else has done this for similar reasons. Book: Programming in Lua: useful for Pico-8? Does anyone have this and did it help you? I've been able to get by picking up a smattering of lua syntax just online, but I enjoy the idea of getting a deeper look at the language. However since Pico-8 is the only platform on which I'm extensively using Lua, I want to make sure the investment would be worth it. How common is it to use classes/oop? I've been using an "object-like" idiom in my Pico-8 programs so far where I have functions where I basically pass in a "self" and do operations on an object. I also tend to keep a "type" variable. That seems to have been enough to get as "object oriented" as I need to be. I've seen that it is possible to hack Lua to basically give you full oop and inheritance. It looks as though it is a hack and not a built in language feature, and from what I've been reading not very many Pico-8 users use it. Is it possible to store favourites.txt in root path? I have pico 8 on my home pc, my work pc, and my raspberry pi, but they each have their own favorites list. Is there a way to put this favorites list in the root path? I have all my carts and such in a dropbox share that all three machines use, but not the favourites.txt. Also is there a way to sort favourites.txt (other than just editing the file and sorting by the column of the title of the game)? Is there any way to make a pattern stop short of 32 notes? (like famitracker has a Bxx effect for jumping to another pattern/frame) I have some music with a repeating section but it won't fit in 32 notes. if I could make it stop at say note 24 (or whatever it ends up being) I could repeat this section in a pattern and not have to waste an extra sfx. Added bee score counter so you know if you're going to beat the high score. Inspired by Dino Riki on the NES. Features Dan (an old friend of mine) netting bees. And screaming: BEEEEEEEES! Scaling text without a black strip at top? However it depends on first printing the text to the screen. I was trying to think of ways I could enable scaled text printing while other things are going on. Right now I just keep a black strip at the top of the screen of my current game so that I can scale text whenever I would like. One idea I had was to create a table outside of Pico-8 that matches the Pico-8 font, and each row would be a single byte where every bit is a pixel, 8 bytes each for all characters in the font, then look up the correct bit when scaling each character, instead. Problem with that is the space it could use up, I guess. I was kinda hoping the font would be in some kind of pseudo "system ROM" readable using PEEK, but I didn't see this listed in the memory map. 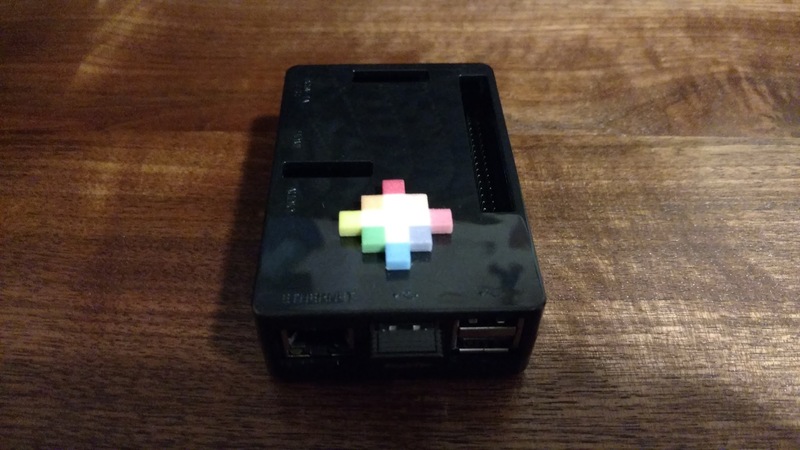 Here's my Raspberry Pi 3, which I'm using as a dedicated Pico-8 machine. I also added a 3D printed Pico-8 logo. Is there a way to adjust how quickly held keys repeat keypresses within the code editor, etc? It appears Pico-8 applies its own setting/behavior to this, it does not inherit it from the host operating system. I like to use very fast key repeat settings, in general. In particular it would be nice for using page up/page down to navigate a large program. Will MIDI keyboard input be added to music editor? I'm simply curious to know whether midi input will be added natively to Pico-8. I enjoy composing in FamiTracker using my KORG nanoKEY2 (tiny piano keyboard for entering midi notes), and I really wish I could do the same in Pico-8. I guess there are workarounds for this, but, I'm still hoping this will be added in the future; it'd really push this product over the edge for me enjoyability wise. I'm considering making a jrpg in Pico 8 at some point. Yes, I know it is a very tired genre. However I really don't mind, I still love it. One thing I was wondering was how to make an overworld that's larger than the 128x64 cels in the built in map memory. My current idea is to represent the overworld in terms of geometry instead of in terms of a grid, rendering the tiles manually (or temporarily filling a portion of the map cel memory). So I'd have like, a mountain range defined as a rectangle, and then I'd overlay rectangles to give them a shape, and have some logic for arranging the tiles around the edges to look correct, etc. Then individual tiny dungeons perhaps would just be hard coded in the map cels. Not sure. I have seen several adventure type games in Pico 8, but...are there any that are trying to give the appearance of being "vast?" I am really interested in the idea of packing a lot of engaging gameplay into a tiny space like this. Why Pico 8 stands out from other fantasy consoles. I'm very fond of this idea of a fantasy console, and I'm enjoying Pico 8 a lot. Every so often, I think, gee, I'd like one with fewer constraints. But then something dawned on me: There must be a point beyond which, if constraints are relaxed too far, the point of being a fantasy console evaporates and you may as well be simply using a more generic game framework. I imagine this has been discussed many times before. But it explains to me why we will probably not see an extremely large proliferation of fantasy console software, the reason being that it is the constraints that make it unique as a console. If we make something as powerful as say protected mode DOS and make it a fantasy console, users may as well either use Dosbox or just write a game with a modern game framework, because the constraints are so relaxed relatively speaking. The craft of fitting a game idea into constraints is gone. I'm aware of Liko 12 and PixelVision 8 and TIC-80 and so forth. The point of my discussion here is just a thought experiment about how much folks would value something that's a lot more powerful---where at that point there's really no need to have it be a console.